After last year's Hell on Wheels, Mrs Diggs and I were unsure of how we would outdo ourselves (yes, it is a competition). We discussed it on and off through the year and started getting nervous in August when we realized our holiday was just around the bend. At a formal meeting of The Ladies Diggs in early September, I elected to show her a recent thrifty treasure -- a skirt set that reminded me of an air hostess in the sixties. The concept for 2010 was born. We each worked to piece together our costumes -- scarves, hats, shoes and more. A couple of weeks ago, she sent a photo of her nearly complete costume and I grew excited. I wasn't sure if it would make a bigger impression than two middle aged ladies rolling about a neighborhood on skates, but I could see its potential. Pretzels were at the ready for distribution (I was surprised to be unable to find small packages of peanuts), as were a few small bottles of wine. Then Mr. Mrs Diggs (sorry, Jack, that might be your new blog name) threw out the idea that a drink cart would really top things off. This suggestion was rather last minute, and Mrs Diggs nearly dismissed it for lack of equipment on hand. Mr. Mrs Diggs then reminded her of a small transport that holds her laundry supplies. And we were well on our way to one-upping ourselves. So while Mrs Diggs and I cackled our way through getting dressed (wigs can be rather funny), Mark and Jack assembled the cart. Sodas (including Tab), Old Milwaukee (it's vintage, right?) and some tiny liquor bottles were added to the mix. Cups...ice...we were ready to roll. Mrs Diggs' youngest was the only trick or treater accompanying us -- my three were with Mr. X (my first post-divorce holiday disappointment) and her oldest went with school friends. A few photos were snapped and we were on our way. Mark, having never witnessed the magic that is the Mrs/Ms Diggs Halloween tradition (except as evidenced in photographs), accompanied us for a few blocks. 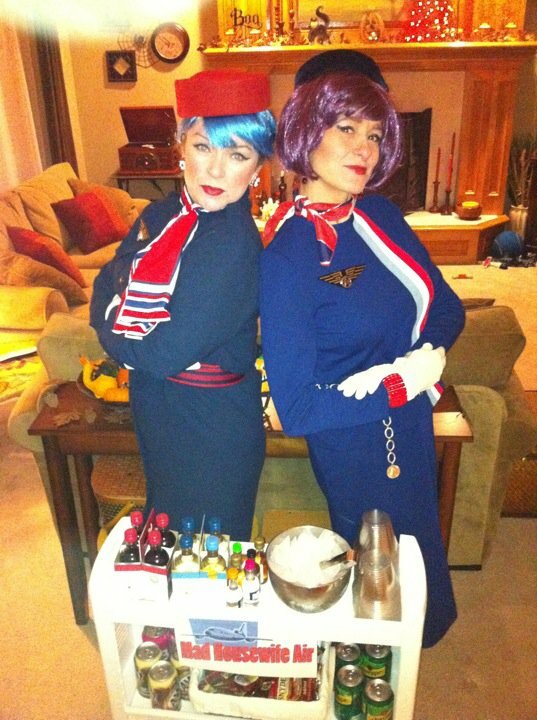 That was plenty of time for word to get around the neighborhood that two stewardesses were serving "refreshments." By the time we made it to the hub of the precinct, we'd tickled more than a few funny bones and satiated our fair share of palates. We even earned a tip! The consensus among our thirsty patrons was that we were the best dressed adults that evening and that we should definitely make a return in 2011. As the din in the suburb quieted, our drink cart lightened. The last few ginger ales were passed out among a conglomerate of pre-teen boys dressed as cheerleaders. To quote Mrs Diggs, "An empty beverage cart means it was a successful flight." Outdo ourselves next year? I can't imagine how.